US demand for cosmetic surgery products is expected to advance 7.4 percent annually through 2014, based on a return to growth in cosmetic procedures. Injectables will remain the largest and fastest growing segment, led by BOTOX COSMETIC, DYSPORT and newer types such as calcium hydroxylapatite. 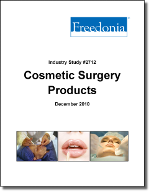 This study analyzes the $1.8 billion US cosmetic surgery product industry. It presents historical demand data for the years 1999, 2004 and 2009, and forecasts for 2014 and 2019 by procedure (e.g., reshaping, implants, lifts and tucks, liposuction, injections, dermal resurfacing, laser treatments), product (e.g., injectables, equipment, implants, wound care disposables) and raw material (e.g., biological materials, polymers). The study also considers market environment factors, details industry structure, evaluates company market share and profiles 31 industry participants, including Allergan, Mentor Worldwide and Medicis Pharmaceutical.